DHRS7 MaxPab polyclonal antibody. Western Blot analysis of DHRS7 expression in human kidney. Western Blot analysis of DHRS7 expression in transfected 293T cell line (H00051635-T01) by DHRS7 MaxPab polyclonal antibody.Lane 1: DHRS7 transfected lysate(37.29 KDa).Lane 2: Non-transfected lysate. 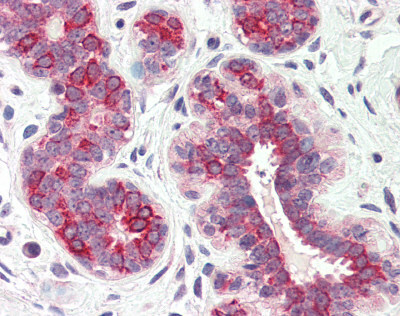 DHRS7 MaxPab polyclonal antibody. 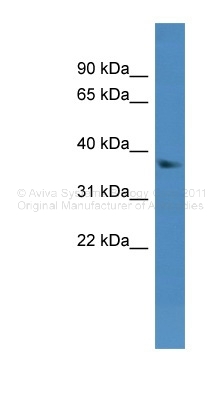 Western Blot analysis of DHRS7 expression in K-562. Western blot analysis of DHRS7 expression in MCF7 (A); HepG2 (B); mouse liver (C); rat liver (D) whole cell lysates. 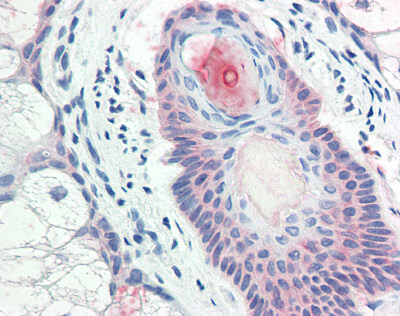 Anti-DHRS7 antibody IHC of human skin, pilosebaceous unit. Immunohistochemistry of formalin-fixed, paraffin-embedded tissue after heat-induced antigen retrieval. 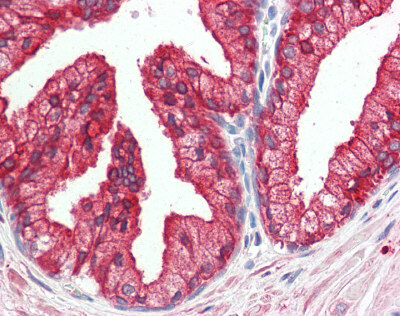 Anti-DHRS7 antibody IHC of human prostate. Immunohistochemistry of formalin-fixed, paraffin-embedded tissue after heat-induced antigen retrieval. 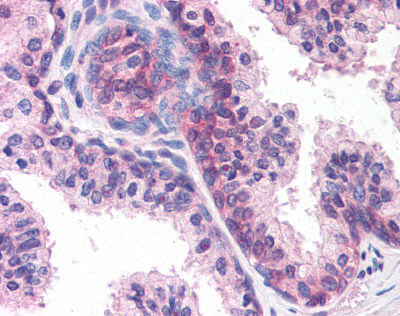 Anti-DHRS7 antibody IHC of human breast. Immunohistochemistry of formalin-fixed, paraffin-embedded tissue after heat-induced antigen retrieval. 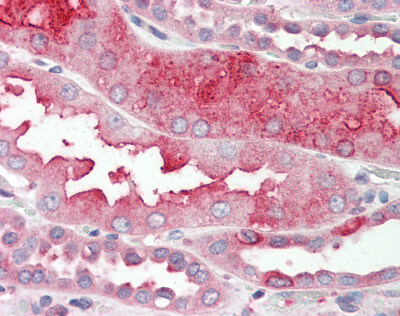 Anti-DHRS7 antibody IHC of human kidney. Immunohistochemistry of formalin-fixed, paraffin-embedded tissue after heat-induced antigen retrieval.